When it comes to filing small brad nails, there is no better arsenal to use other than the brad nailer. It is a powerful tool that specializes in nailing these little nails on tight corners and hard-to-reach spots. Moreover, the best brad nailer can do the job efficiently and smoothly. Some of you might assume that brad nails can work manually. Well, those that have dextrous hands can achieve such feat. But let me remind you that it is a challenging and time-consuming process. You just have to realize that most brads nails have a length of only 5/8 inch to 1 1/2 inch. If you consider such dimensions into account, you might understand that dropping your hammer is a good idea. You can't work with brad nails by the traditional means. Brute force is useless here. Instead, you should rely on the efficiency and speed that brad nailers can offer. With them around, you can do various renovation and finishing jobs. You don't have to break a sweat too much as these tools will do the hard part for you. You can choose various options for brad nailers. But I have a few recommendations that you should check out before you head out to your local store. These following brad nailers have an excellent reputation in the power tools community. See all of their features and assess which one of them do you like the most! I can testify that the DEWALT DC608K brad nailer is a device that can do the job right. It is a powerful brad nailer that exhibits extreme precision in nail placement. It can also keep up with your pace, too. The speed and smoothness of this nailer are quite similar with pneumatic nailing. It can provide an excellent output, just like the professional touches of hand nailers. Notably, the DEWALT DC608K is a compact brad nailer. It is a cordless tool, which makes it portable. Therefore, carrying this device would never become a problem on your part. The device can accommodate 18-gauge brad nails that range from 5/8 inch long to 2 inches long. It also features an insane driving speed, which can rate as much as five nails per second. However, the best-selling point that the DEWALT DC608K is it doesn't require the help of a compressor. You are no longer required to drag an air hose wherever you work, which is annoying and cumbersome. It is an ergonomic feature that directly improves the efficiency and smoothness of your projects. 18-volt NiCad battery powers the DEWALT DC608K brad nailer. Meanwhile, its magazine can hold up to 110 brads, which is amazing. It simply lessens your need to always refill from time to time. The device also has a seamless construction to prevent the entry of debris and dust. These external components are the common causes of damages among any power tools. The world of power tools is not complete without the innovation brought by BOSTITCH. This particular brand has regularly been competing with the other main brands like Makita and DeWALT. When it comes to brad nailers, I can say that BOSTITCH has a lot say. Specifically, their BOSTITCH BTFP12233 Smart Point 18GA Brad Nailer is a package that any professionals and DIYers should consider. The features that it has will allow you to accomplish various tasks and projects smoothly. This particular brad nailer has a specific design of driving 18-gauge brad nails that have a length of 5/8 inch to 2 1/8 inches. Therefore, it easy to say that this device has a comprehensive scope when it comes to the brad nails that it can cater. The BOSTITCH BTFP12233 also features the Smart Point technology. The latter enables quick and flawless placement of pins due to the presence of a small nose. Its nose is quite smaller than other BOSTITCH brad nailers. Moreover, there is no need for you to press the contact trip of this brad nailer before you can actuate it. As a result, you will efficiently reduce damages on your workpiece. I like that the BOSTITCH BTFP12233 can work without oil. Therefore, oil stains are excluded in the scene already. You will also love that this tool comes with a tool-free release system. With this mechanism, you can disengage the tool in cases of jams. It lessens the risk that you encounter on your work. Meanwhile, its Dial-A-Depth component enables you to countersink the nails quickly. For those that want a great brad nailer but do not have enough bucks to throw into, I present to you this option. The Hitachi NT50AE2 is a powerful brad nailer that comes with a reasonable price tag. It has the performance and quality that you would not expect for its given value. You can use this tool for small carpentry and woodworking projects because it comes with precision and accuracy. Of course, its power is something that you should not underestimate, too. The Hitachi NT50AE2 features a magazine that can contain 100 brad nails at a time. Therefore, it is a high-capacity option that lessens the need for constant refilling. The device also features voluntary actions so that you can achieve tool-less transitions in firing. You just have to slide its selection control so that you operate the machine in either continuous or intermittent firing. As a result, you can take on jobs that either requires precision or speed. This tool offers an ergonomic depth-of-drive knob near its nose. Just turn the knob so that you can adjust how deep the nails should function into your workpiece. It is a very convenient feature that improves the speed of your work. Furthermore, the magazine of this power tool has a bottom-loading mechanism. It can be quickly accessed and can cater 18-gauge nails with 5/8 inch to 2 inches length. There is also a pin indicator that allows you to keep track on the remaining pins on the magazine. Unlike other brad nailers, this device is lightweight. Specifically, it only weighs 2.2 pounds. Therefore, it is completely maneuverable. Meanwhile, its handle has a polymer cover to ensure a slip-free grip and control. It also makes the Hitachi NT50AE2 very comfortable to hold. The PORTER-CABLE PCC790LA is a professional option. It is a brad nailer that works well with heavy duty applications. It has a sturdy and durable construction, which makes it impervious to any potential damages. Specifically, this unit is a cordless model, which a 4.0 Ah lithium-ion battery powers. Therefore, you can ensure that it can last long in the field. In fact, this tool can drive up to 1,300 nails per a single charge! Just like some of the brad nailers here, the PORTER-CABLE PCC790LA can operate without the need of compressors or gas cartridges. These extensions are quite expensive. Once you invest on this tool, you will not need anything else. Of course, on the side of performance, this brad nailer is extremely reliable. It can provide consistency on the depth of its drive, thanks to its easy depth adjustment dial. If there is a need for countersinking, this tool can help you with that. The device also offers a release lever in cases of nail jams. As a result, you can work without experiencing any fusses, even if small interruptions do come. Meanwhile, its motor has a special design that enables stability in firing regardless of any materials that you are using. Moreover, this device can work even in cold conditions. Because most of the features of the PORTER-CABLE PCC790LA have a tool-free mechanism, it is guaranteed safe to use. It also improves your productivity rate. The unique design of this brad nailer allows the distribution of weight focused at its center. As a result, you can experience maximum convenience while you are using this tool. The Makita XNB01Z brad nailer is a beast that you should choose. 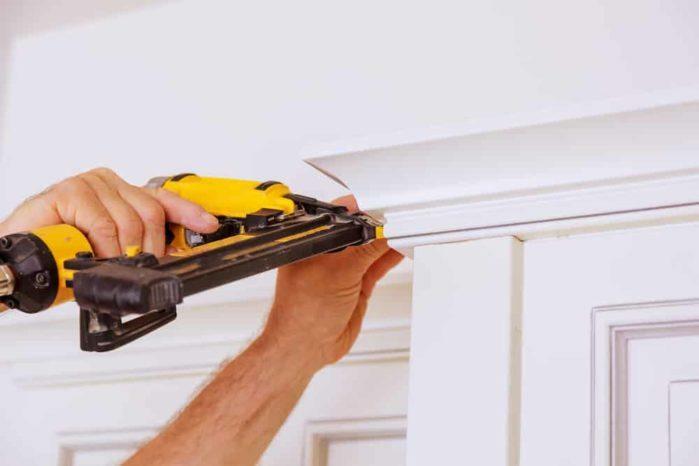 It is an excellent option if you are doing large-scale projects, especially those that involve the installment of moldings and narrow trims. Despite its power, this device remains to be compact. It is not exactly lightweight, but it has a weight that you can actually "feel." As a result, you can easily maneuver this tool without any complications. Just like the rest of the brad nailers that I have listed here, the Makita XNB01Z is capable of driving 18-gauge brad nails (from 5/8-inch to 2-inch nails). Moreover, it has a maximum magazine capacity of around 110 nails, which is more than enough already. With its 18V LXT lithium-ion battery, this battery pin can fire up to 1,000 nails per one charge. But perhaps, the main selling point of the Makita XNB01Z is its Star Protection Computer Controls. It is an exclusive technology to Makita only. This particular innovation integrates real-time monitoring to the power tools created by Makita. As a result, the device will automatically protect itself from over-discharging, overheating, and overheating. It is a convenient feature that improves the lifespan of the tool. All the essential components for a brad nailer is present on the Makita XNB01Z. It has two firing modes, depth adjustability controls, and an ergonomic visual gauge for the battery level. Using this device is also very convenient, thanks to the presence of a belt clip and comfortable handle. It is important that your toolkit in your garage has a brad nailer. It can help you simplify the ever pesky task of dealing with brad nails. As I mentioned earlier, this pin is quite small. Using the wrong tool will just leave your efforts in vain. Moreover, there is a risk of injuring yourself if you will hammer it manually. Of course, we don't have to buy brad nailers from time to time. A good unit of brad nailer can last for at least a decade, especially if you maintain it properly. But before you can experience its benefits, you must learn how to segregate the bad from the good one. I will teach all the basics in the next section. Therefore, drop whatever you are doing right now and focus your attention here first. Brad nailers are not all the same. Therefore, it is important to choose which one of these will fit your indeed needs and applications. It is undeniable that pneumatic brad nailers are popular these days. As its name suggests, a pneumatic brad nailer draws its power from an air compressor. The air travels through the hose and transports it to the nail gun. In a brief amount of time, this nail gun can deliver smooth and flawless results. The primary reason why pneumatic brad nailers are popular is due to its quality. It can provide correct and professional output in a very speedy manner. Even if the task is quite complex, its efficiency doesn't lessen. But of course, there are still some downsides when it comes to pneumatic brad nailers. One of this is the potential harm that the pressurized air poses. Therefore, you need to be careful whenever you are using the device. You have to familiarize the setup so that you won't go on the wrong side of things. Another thing that you should remember is that pneumatic nail guns are not portable. Always bear in mind that the air hose has a limited length. If you are working with large spaces, this type of brad nailer is not the best option. There are two types of electric brad nailer: cordless and corded. The corded model is still the same with pneumatic brad nailers. Their only difference is the power source (which is pretty obvious). Notably, corded nail guns are lighter than their cordless counterpart. Because it doesn't have any batteries, its overall weight reduces significantly. Moreover, it can give you unlimited performance as long it is plug to a power source. 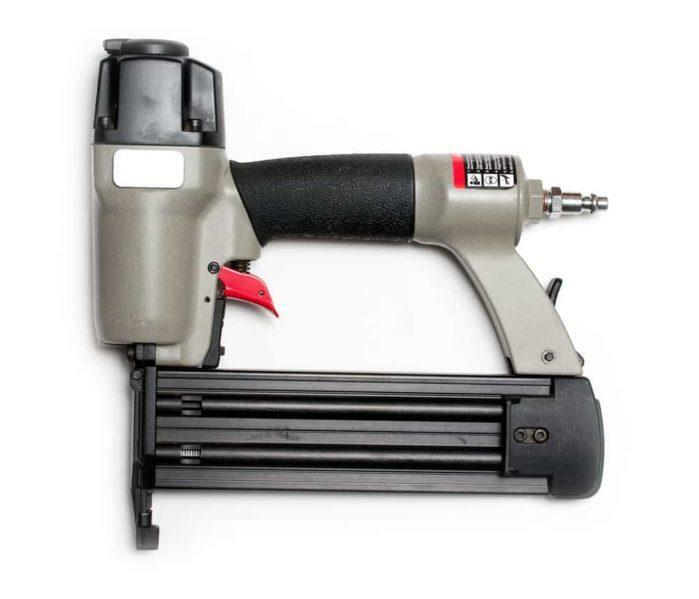 But similar to pneumatic brad nailers, corded brad nailers have physical limitations. Fortunately, this decreases the operational risk, as most manufacturers today have integrated protective measures against overloading and overheating. For those who want the benefit of portability, you should choose cordless brad nailers. They will give you the freedom wherever and whenever you want. Take note that the latter is quite cumbersome. Moreover, your operating time is limited whenever you are using cordless brad nails. Therefore, you should choose those units that come with lithium-ion or NiCad batteries for a longer lifespan. It is pretty essential to consider the size or dimension of the brad nail that you are going to use. It will allow you to choose a compatible brad nailer. Most of the brad nails today have 18 gauge. Therefore, brad nailers that have 5/8-inch to 2-inch nail length compatibility can cater them. Most of the time, brad nails are suitable for framing doors and window casings. Moreover, these applications require multitude nails, especially if you are working with thick hardwood. As a result, it is entirely necessary that the brad nailer you choose can accommodate to these small nails. Another aspect that you should look for brad nailer is its depth adjustment. You can never maximize the versatility of your tool if it does not allow you to control the depth of the sink of the nail. The brad nailer becomes a more useful tool in the field if this feature is present. Moreover, it should be accessible, too. Otherwise, the materials that you can work on will be limited. It would be great if the brad nailer you have has a large capacity. It just allows you to work continuously without the need for constant refilling. That is a great feature, especially if you are working on large projects. You don't want your pace to be hampered by always running out of bullets. Ideally, brad nailers that have magazines that can hold up to 100 pieces of brad nails are great already. To further improve the versatility of your brad nailer, it needs to have an angle adjustment feature. Some workpieces will require you to work from various angles. Of course, this is difficult if the nosepiece of your brad nailer remains to be static. Make sure that it can rotate on different and specific angles to cater your specific needs. Of course, all of the brad nailers that I featured here have excellent capacities and performances. All of them possess the said requirements that I listed in the previous section. Therefore, investing on any of them is quite a wise move. But among them, the DEWALT DC608K captivated my attention. It has the flexibility and speed that I look for a brad nailer. It is cordless and compact brad nailer that can work on various workpieces. It comes with different adjustable features so that you can have overall control on your project. Moreover, it has a high-load capacity. You can drive nails continuously with this tool, which is a significant factor. ​​​​​The DEWALT DC608K is my best brad nailer. But I know that some of you have different thoughts and take on this. Of course, I welcome all of those opinions of yours. In fact, you can tell them to me in the comment section below! You can also freely share this article on your social media accounts. I am pretty sure that sharing is synonymous is loving!